The first time I got a sense of what a youth-led social justice movement looked like, I felt an instant connection to it. At the time, I was a youth trainer and active in my school’s GSA club. Making a difference in my school and in my hometown of Fresno had become part of my everyday life, but I didn’t really know what it felt like to be part of a movement. I definitely didn’t see myself as a ‘leader’. I was invested in LGBTQ+ youth organizing because I knew that the lives of trans and queer youth were on the line. Youth organizing allowed me to make real connections with young people across California. Many of us just wanted to do more–attend more trainings, speak to our school Boards, meet with legislators–because we knew that changing school climates and creating safe spaces meant that we could save lives. The stakes were high if we chose to step away from this work. It was clear to me that the work I was doing was impacting the quality of life for trans and queer youth. Just knowing how truly important it was kept me pushing forward when it felt like more than I could handle emotionally and physically as a high school student. What wasn’t immediately apparent was that I was taking big steps forward: from participating in my GSA club and attending local trainings to eventually sitting on a regional Youth Council and being invited to attend the National Gathering of GSA Networks. I started to see different pathways open up for me. I had experienced what they meant when they said we were building a pipeline of youth leaders. I was now one of those leaders. 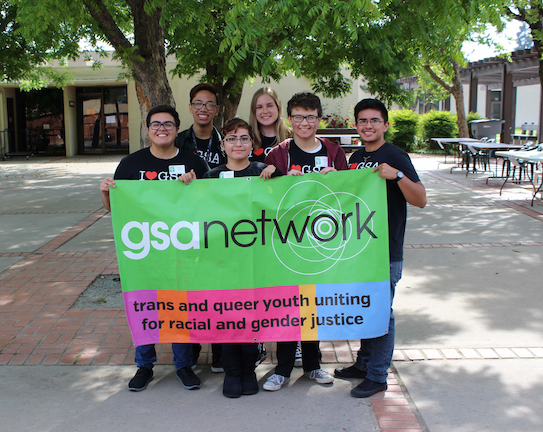 After a few years, my leadership crystallized into something I had never imagined: I was hired by GSA Network. The organization and people who had supported me in learning about LGBTQ+ justice and advocating for my rights when I was in high school now wanted me to do the same thing for other trans and queer youth in my local community. It was surreal. And yet I knew that the next step for me was to take ownership of our movement to ensure that it continues with youth at the forefront leading the way. I had never intended to do social justice and activism because I wanted to be a ‘leader’ or because I envisioned a job opportunity down the road. Trans and queer students like me become activists because we care about what happens to us in school and we believe in creating change. We believe that this work is transformative and is capable of saving lives. It’s up to us to step into our leadership.